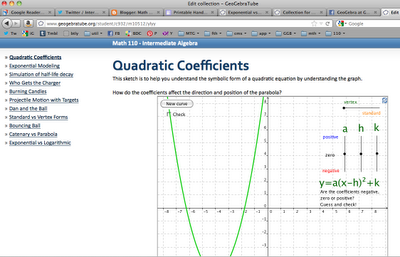 So we had a small group in for GeoGebra learning this week, and I want to share what I've learned. One of the best ways to learn anything is to try and teach it, and this was true this week. This post is a review of our approach with links to the materials, and some description of what the intermediate users were interested in: images, buttons, input boxes, and more. First up is our revamped website. 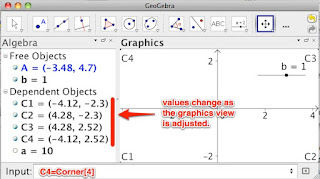 I'd really like this to be a resource for anyone learning or teaching GeoGebra to others, so please send feedback. The old website had gotten pretty clunky, as we modified and added to our materials, and it was time to start fresh. The website also includes a page with all of our handouts, and a nice Resource section. 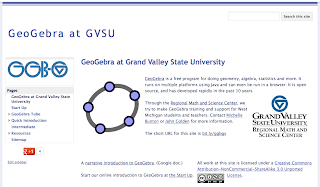 Besides the website, we started a local GeoGebra Facebook page that we could use for links and resources. The program is so intuitive to use, that many teachers can go from there. GeoGebraTube is such a huge sell, that I tried starting with it, but it turns out that it's even bigger when people know how easy and free the program is to get. They can explore the sketches on the tube better with just 5 minutes on using the program first. I separated that out into three pages at the website: Start Up, GeoGebraTube, and the Quick Introduction. I asked participants to record the Tube finds they liked the best on a Google doc, but I've also just asked them to write the Tube number on the whiteboard. We covered search, tags and user profiles, all of which enable finding cool stuff. For the Basics, the list of intro tasks has gone through several iterations and seems to work pretty well. Getting through those gave users a fair amount of control. The first non-basic topic most people are interested in is usually is using images in sketches (often inspired by the Dan Meyer inspired Dan and the Ball sketch). 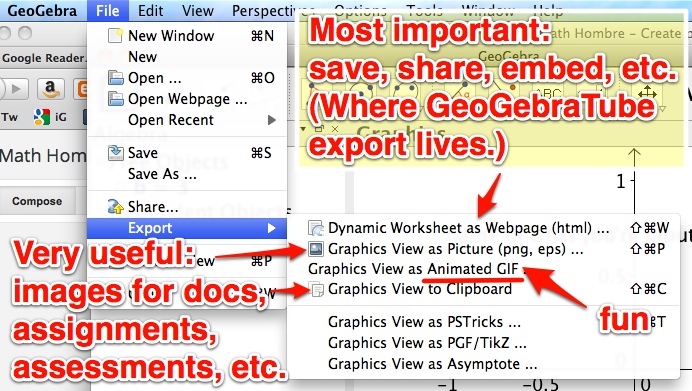 If it's not images, teachers are interested in the spreadsheet view. 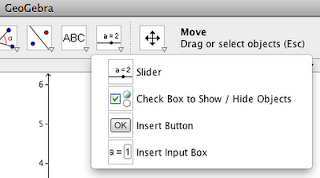 So we've got a guide to using images and a starter for the spreadsheet. 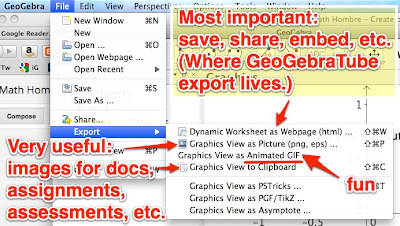 It's also important to cover the export menu. RandomBetween[ ⟨ minimum integer ⟩ , ⟨ maximum integer ⟩ ] - does just what you'd think it would. Very useful for generating targets or random polynomials using this for coefficients. You get new values by choosing Recompute All Objects from the View menu. Function[ ⟨ function ⟩ , ⟨ start x-value ⟩ , ⟨ end x-value ⟩ ] - limits the domain of a function. Best technique for this is often to define a function f(x)=... then make a limited version of the function using the Function command. Richard Wade shared with me a neat challenge that provoked some good work as well as some instructions on animation, etc. This is my entry for a dynamic Olympic logo. I also think they should include a purple and orange ring, but I understand the importance of tradition. I wanted an interlocking rings effect, but couldn't figure out an over/under trick. A note about embedding animated gifs: some services are weird about it. If you're having trouble, upload it to a photo sharing site (I use the mildly annoying photobucket) and put in the image by URL. The main feature that's come up that we don't have a guide for yet is the dynamic text. Text is next. 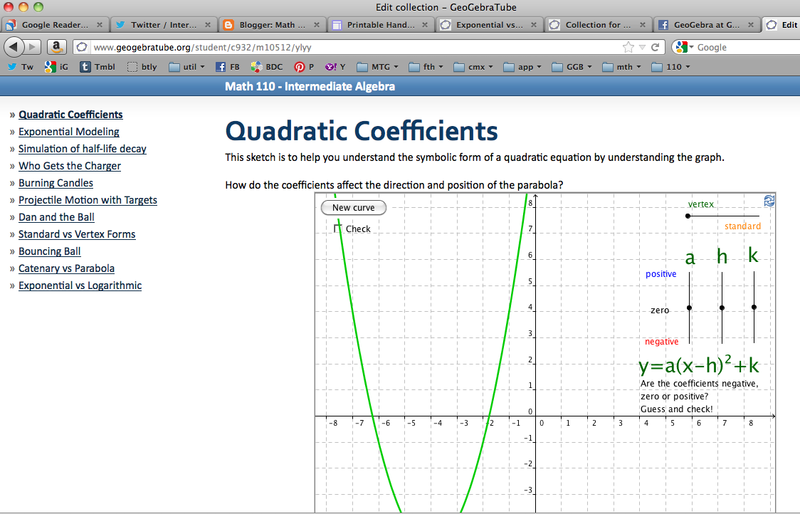 Whenever you get to work in a group with GeoGebra you learn something. The two tidbits I found most useful this time was the Corner[ ] command, which we found in an Anthony Or (orchiming on GGBT) sketch. Someone asked "Well how did he make two sets of axes?" and the answer was clever use of the corners. The other was instigated by a participant: looking into what that student option is in a GeoGebraTube collection. When you click Create version for students, you get a menu of choices. You get a palette of sketches for students, like this. That's going to be a great feature. 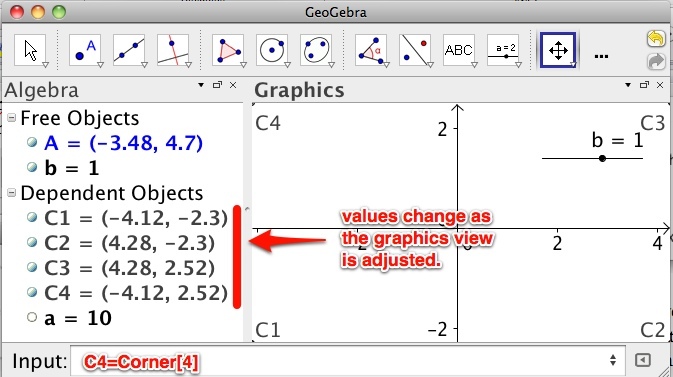 Hope this can be of use to you for your GeoGebra learning, or with fellow teachers or with your students. I'm happy to share any materials electronically, or in person if you're within driving distance. What would be helpful for you? The student view of a collection is pretty darned cool! I never even noticed that button on the page!